Strategic planning refers to an organizational process which aims to define strategies within an organization and make great decisions that work in the effective allocation of resources while also helping the organization reach its defined strategies. In order for the strategic planning process to be successfully carried out, it is essential for everyone to understand the present position of the organization while also learning the potential avenues that will let its people pursue a specific course of action which is suitable enough for the established organizational strategies and objectives. Strategic planning also aims to determine where your organization will go within a specified period and the actions that you need to take in order for it to reach its long-term objectives. It is different from business planning because a business plan is primarily focused on a specific product, program or service while a strategic plan is established primarily for the whole organization. Different models, approaches and perspectives are also used by experts when carrying out the strategic planning process. The strategic plan is developed by taking into consideration essential organizational factors including the nature of leadership within the organization, its culture, the complexity of its environment, its size and the skills and expertise of all its strategic planners. With a well-developed strategic plan, your business organization will have an easier time surviving in the industry while significantly boosting its competitive edge. 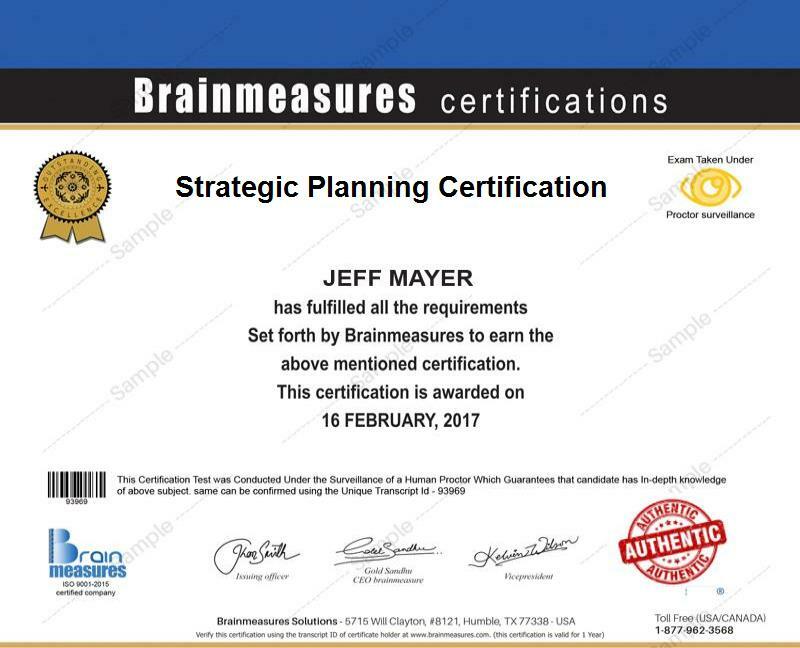 The strategic planning certification program which is now offered by Brainmeasures is the most suitable certification course for you especially if you are one of those who wish to gather relevant information about the strategic planning process. The strategic planning course offered by Brainmeasures explains all the details of this process comprehensively so you have a hundred percent assurance that you will come out as an expert, knowledgeable and certified strategic planner after completing it. The strategic planning certification course lets you undergo a highly reliable and comprehensive strategic planning training which covers all the vital concepts, strategies and principles behind the process. This will make it easier for you to handle the tasks of establishing a more effective strategic plan for an organization. Completing this online certification course gives you the chance to finally take a hold of your certificate which showcases your skills and expertise in handling the entire strategic planning process. The strategic planning certification program aims to help a lot of individuals and professionals who want to make sure that the organization that they are working for continues to survive in a highly competitive business industry. The certification course is primarily aimed at individuals responsible in the development and implementation of strategic planning initiatives and executives, senior managers and division leaders who are tasked to develop an effective strategic plan. Your strategic planning certification is also extremely useful when it comes to significantly boosting your financial stability. Completing your strategic planning certification course gives you the opportunity to work as a strategic planning analyst and earn around $81,000 annually from this profession. Working as a strategic planning manager is also very rewarding because it allows you to enjoy an annual salary of $110,000 to $132,000. If you work as a strategic planning director, then this profession can let you earn within the range of $115,000 to $167,000 per year.